Shopify - How can I automatically redirect my visitors to their own language? In this article, you'll find how to automatically redirect your visitors to their own language. Weglot provides an "auto-redirect" feature. When activated, it automatically redirects the visitor to his language, based on his browser's language. 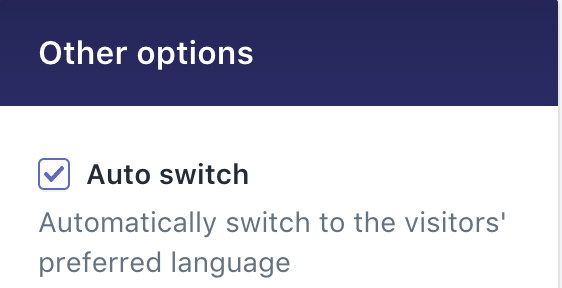 To activate this feature, go to your Shopify Dashboard > Apps > Weglot translate > Other options, check the "Auto Switch" option and click on "Save". Once you've checked that box, visitors will be automatically redirected to their own languages (if selected in your destination languages). If you don't support the visitor's language, s/he'll be automatically redirected to the original language of your website.